An Italian composer born March 12, 1964 in Reggio Emilia (Italy). Stefano Bonilauri studied composition, choral music and the piano at the conservatories of Bologna and Reggio Emilia. He was notably a pupil of the composers Armando Gentilucci, Fabrizio Fanticini, Adriano Guarnieri and Alessandro Solbiati. 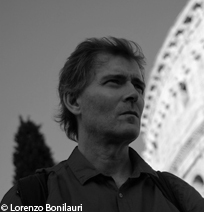 Bonilauri composes works for solo instrument as well as chamber music, including: Quartetto III for accordions (1996), premiered at the festival Nuove Sincronie in Milan; Con-corde for violin and cello (2003), commissioned by the Ensemble Aleph; Luce Radente for soprano, instrumental ensemble and electronics, first performed at the festival Manca of Nice in 2006; P.O.I.N.T. for 12 cellos, first performed by the ensemble Nomos in December 2012 at the Théâtre Dunois in Paris. Composing with precisely differentiated elements, Stefano Bonilauri develops a homogeneous blend. It mixes theatre and music, nature and culture. It re-examines the relationships between the instrument, the body and the voice of a musician as it contributes to the instrumental play. Bonilauri teaches harmony at the music school of Castelnuovo nè Monti.